4 channel video from 16mm film. 85 min col. These are the opening words of the first personal exhibition of Jonas Mekas (Biržai, 1922) at APALAZZOGALLERY. These words of the Lithuanian poet and movie-maker prepare us to the waterfall of frames that fill the nineteenth-century halls of the gallery. Those words refer to all the images and sounds gathered by Jonas Mekas, after the invitation from the curatorial duo Francesco Urbano Ragazzi, for The Internet Saga Project presented at the Biennale di Venezia 2015. So, this new exhibition is both its translation and a poetic development. All the pieces exposed this year in Venice, come to new life in Brescia, where the gallery is based: a new life that can be seen in In an Instant it All Can Back to Me, 768 original slides, 768 frames from the films realized between the ’60s and the ’90s, that for the first time in the artist’s career are impressed on 32 monumental glass plates. There are also the three original editings of the Online Diary, a videodiary updated by the artist almost on a daily basis since 2006. An then, To Petrarca an audio piece composed of 51 tracks that record the life of the artist between little moments of daily joy to important historical moments. And also Birth of a Nation a film that, on four monitors, distributes 160 portraits of the authors who made the history of experimental cinema – from Peter Kubelka to Michael Snow – accompanied by a photographic series of 40 elements never shown in Italy. Describing who Jonas Mekas is is not easy. Founding father of New American Cinema, the Film-Makers Cooperative and Anthology Film Archives – maybe the biggest archive in the world dedicated to audiovisual experimentation – he is a key figure not only in the history of cinema, but also of art and literature. His story has its beginnings in a small village in Lithuania and then a temporal and geographical range so wide that it touches upon the Fluxus movement, the Beat Generation, Andy Warhol’s Factory until finally anticipating and foreseeing the post-Internet age. After being sent to a labour camp in Elmshorn during World War II, Mekas arrived in New York in 1949. There he became the connector of a community of artists which, to name a few of the encounters that Mekas’ camera records in its incessant activity, included: George Maciunas, Allen Ginsberg, Andy Warhol, Carolee Schneemann, Stan Brakhage, Kenneth Anger, Jack Smith, John Cassavetes, Yoko Ono, John Lennon and Velvet Underground. In addition to these great cultural and societal icons, however, routine moments from daily life are filmed and captured with the same intensity: a flower, a street, thunder during rainfall. As such, Mekas’ visual diaries compose a great tale that celebrates the course of existence between banality and lyricism. Until his arrival on the web in 2006, to take cinema beyond its limits. With all these images and these sounds, the exhibition celebrates Jonas Mekas, jonasmekas.com and the first ten years of the Internet life of a prophetic artist. Ten years that talk about a personal and historical transition from the independence of the cinema avant-gardes to the autonomy of the online fruibility, from the birth of the glorious Nation of the Independent Cinema, to the origins of the Internet people. All these images, these sounds talks about many flowerings. A sequence of seasons and episodes that avoid the rigidity of the series and that take us in the neverending show of reality, in rhythm with the pace of life. From the improvised choir at the Serpentine Gallery to the projection of Andy Warhol’s Empire, passing through the Forest of Karlshrue and a Paul Sharits exhibition, a dinner with Agnes Varda in Paris, a lunch with his family, to the first day of the year for the classic speech at Saint Mark’s Church. And also flowers, animals, snow, lunar eclipses, wind and brief glimpses of beauty. To keep it altogether there is the existence of the artist and of everything that passes through his lens. An intermittent circle that, from natural cycles to machines, goes through all he shots and ends up in correspondence to reality. The diary becomes cinema, internet, building, gallery, life. On to a new season. 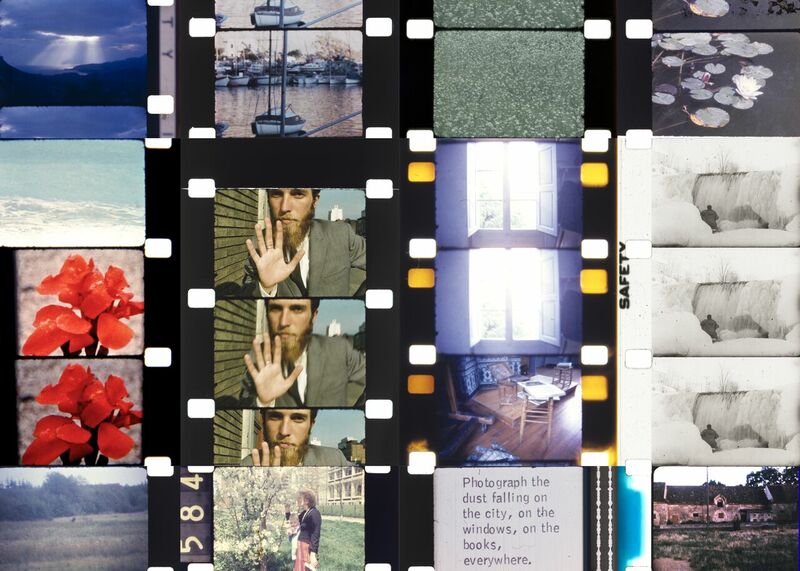 For the first time, the film scraps that Mekas uses to realize his photographic compositions are juxtaposed in a series of glass walls. Through a digital print process, the pictures selected by the artist, mostly unpublished, are impressed directly on glass, regaining the film transparency. 768 film-frames, scanned and isolated from Mekas’ movies are assembled and recomposed on 32 glass walls, giving life to a big magical lantern that can be consulted as an archive. The images are set up in columns in a sort of grill through which the eyes catch what they’re interested in, similarly to what happens in the countless photogalleries that we usually scroll on our smartphones. Throughout the 32 windows, that seem to recall the sacrality of a cathedral, there is a celebration of the flowing of life. This is a collection of instants, majestic yet simple, where the simplicity of flowers, sunsets, or stray dogs share their space with rare portraits of famous and not so famous film-makers and artists such as Barbara Rubin, Peter Kubelka, Gozo Yashimasu. There are also extraordinary scenes like the ones shot during the strike organized by Salvador Dalì against the Mona Lisa in New York in 1963, or Yoko Ono and John Lennon’s performance Up Your Legs in 1970, or the opening ceremony of Andy Warhol at the Whitney Museum in May, 1971. 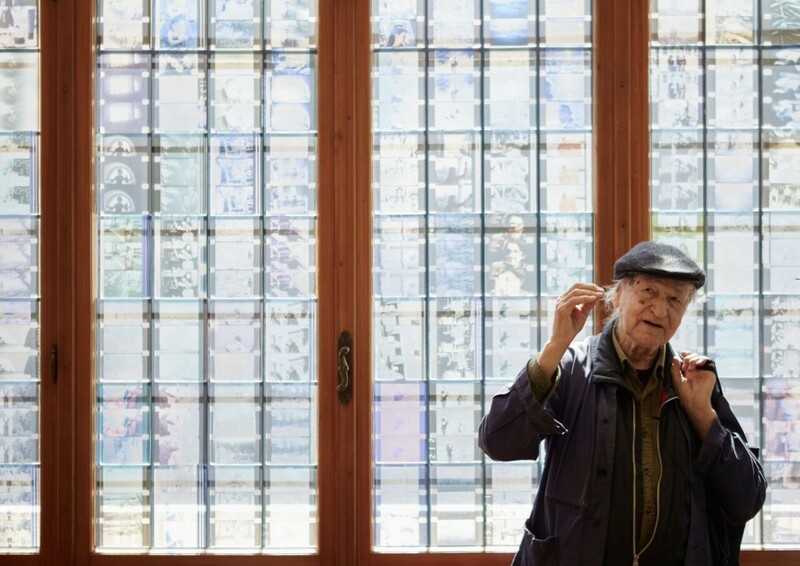 The 32 glass walls are presented in two different formats, recalling the dimension of the windows in Palazzo Foscari Contarini in Venice, where they were presented as vinyl film transfers during the 56th Visual Arts Biennale. 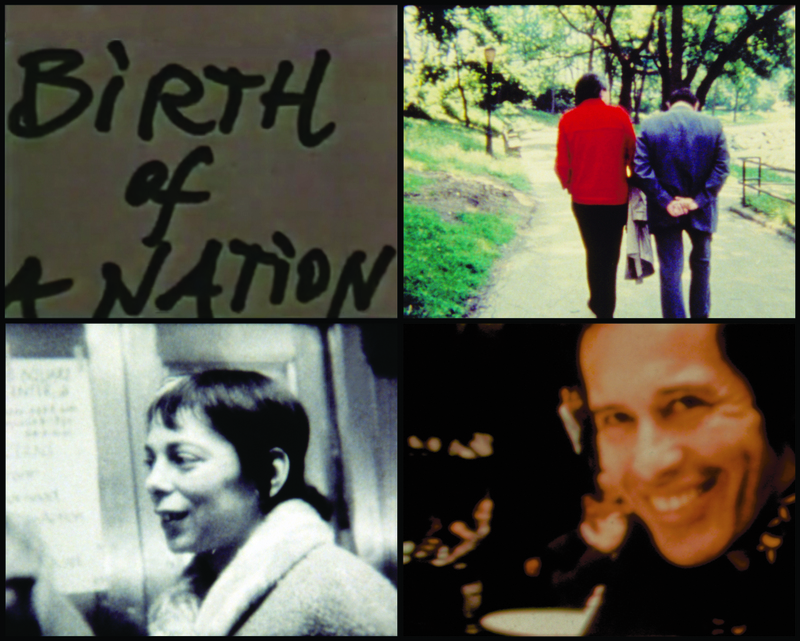 Birth of a Nation, 4 channel video from 16mm film, 85 min col., 1997. Birth of a Nation Family, 40 c-prints ed of 3+1 ap. 50.8 × 40.64 cm each, 2008. This is the manifesto that Jonas Mekas wrote to introduce his 4 channel film installation: «One hundred and sixty portraits or rather appearances, sketches and glimpses of avant-garde, independent filmmakers and film activists between 1955 and 1996. Why BIRTH OF A NATION? “Because the film independents IS a nation in itself. We are surrounded by commercial cinema Nation in the same way as the indigenous people of the United States or of any other country are surrounded by Ruling Powers. We are the invisible, but essential nation of cinema. We are Cinema.” Music by Richard Wagner and Hermann Nitsch. The film comes with 40 photo portraits, stills that eternalize some of the founders of this Country. The artist identifies the group as his cinema family. 1. The First 40, video, 92.27 min, 2006-2015. 2. 365 Day Project, video, 93.47 min, 2007-2015. 3. Online Diary Selection, video, 110.51 min, 2008-2015. The third monitor in the exhibition is dedicated to the constantly updated flow of the artist’s website from 2008 to the present. Last but not ultimate. It’s one of the countless possible editings of the online diary in progress of Jonas Mekas, which will celebrate its 10th anniversary in 2016. To Petrarca, audio installation, 70 min. loop, 2003. To Petrarca is a 70 minute symphony that alternates 51 tracks recorded between 1968 and 2001. Here, for instance, we can hear urban sounds taken in the streets of New York, poetic declamations and the sounds of Andy Warhol’s funeral wake. The title of the opera reminds us, in this context, of Petrarca’s failed attempt to transfer his personal library to Venice: the story of an encyclopaedic adventure that remains incomplete.The fragment and the diary are once again the preferred forms through which Jonas Mekas tells his own story.